“We’re off down the pub for a few pints and some dinner”. That sentence couldn’t be any more English if it was covered in clotted cream and its first name was Nigel. The pub is a staple of British life, or at least mine. The development of the gastro pub has raised the standard of pub food from the traditional chicken in a basket of years gone by. So the Horse and Jockey on Chorlton Green is no slouch in pairing fine food with fine brews. Since undergoing a massive overhaul several years ago, the Horse and Jockey has really become a corner stone of the local community. Hosting everything from Farmer’s markets to Bonfire night displays, this pub has also stepped up the food and drink on offer. As well as an extensive drinks selection, the pub now has its own microbrewery producing some tasty beers under the Bootleg Brewing Co. brand. The food is split into two with the restaurant style menu and the pub menu intertwined. When I popped down with a few friends we took the sensible approach and ordered a few beers and more food than we could sensibly eat. The meal was nearly entirely derailed by the shocking announcement from the bar that there were no Manchester Eggs. Now I assume that a staggering demand for this god-like snack left them egg-less, because to have under-ordered would be bordering on criminal negligence. Anyway, hiccups aside we order our meals and waited. The starters arrived first, as is the custom and the envy across the table was palpable. My choice of nachos could not have been more wrong. While the dips were good and the cheese was salty, they were average at best. My girlfriend’s choice of the chipolatas with Coleman’s English mustard couldn’t be a bad call as the sausage meat was great. 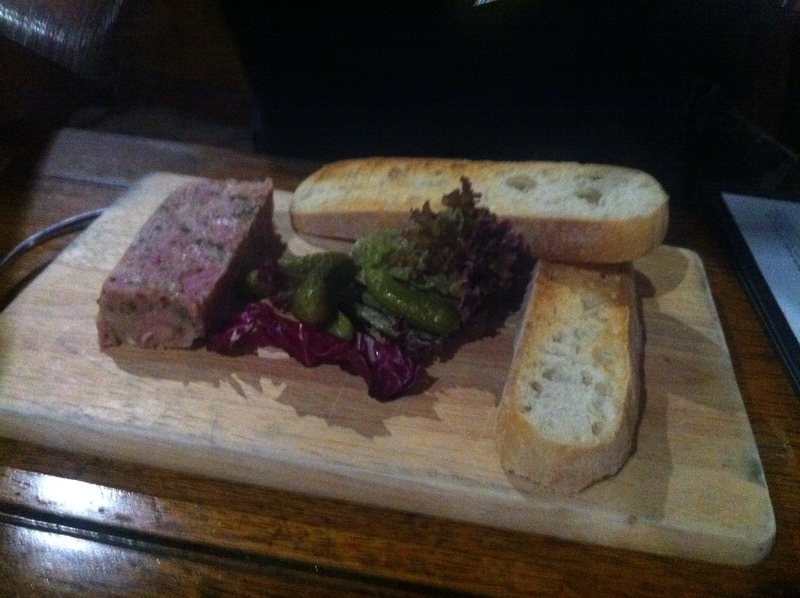 The best choice by far on the table was the potted ham hock terrine with wholegrain mustard dressing and crusty bread. While I didn’t get to taste it, I’m assured it was good. 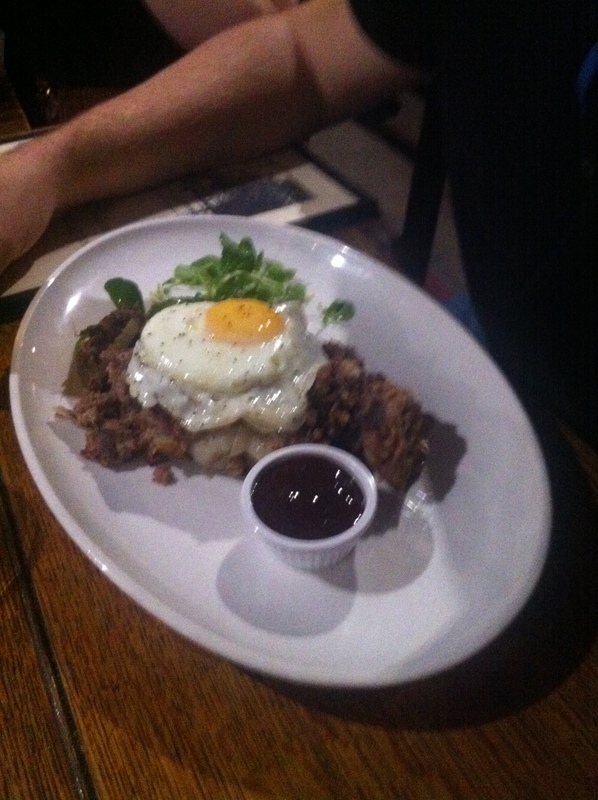 The mains were good, but my really interest was in the classic take of corned beef hash with fried egg and HP sauce. The hearty, meaty texture looked spot on and again the taste (I was told) was good. I would have asked for a bit but my steak and ale pie with fat chips or creamy mash, carrots and peas , a mammoth pie and mash combo capable of filling the gaps in your hunger like concrete filling foundations. It is however a little tastier. The main event for me was the burger. Specifically, the ‘Ultimate Burger’ which towers above puny normal burgers. 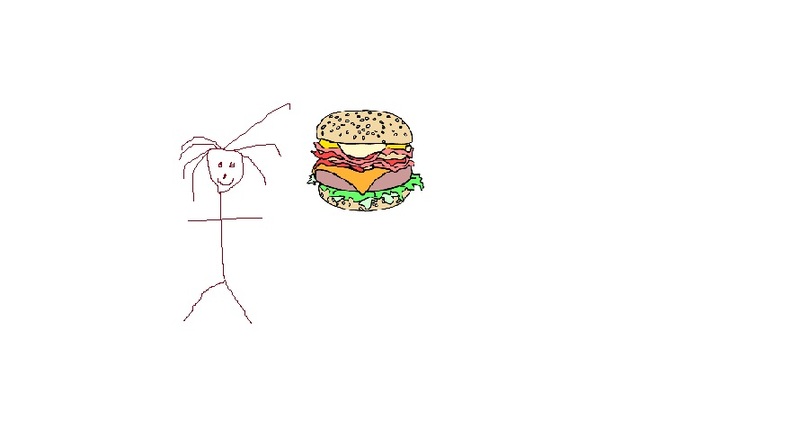 I have a photo proving that this burger was as big as my girlfriend’s head, but she won’t let me use it, so I’ve done this artist’s impression. All in all, the food was good standard pub fare, but in a pub as long as the food is warming and homely, the beer is cold and crisp and the atmosphere is good, then I’ll happily stay for another pint.